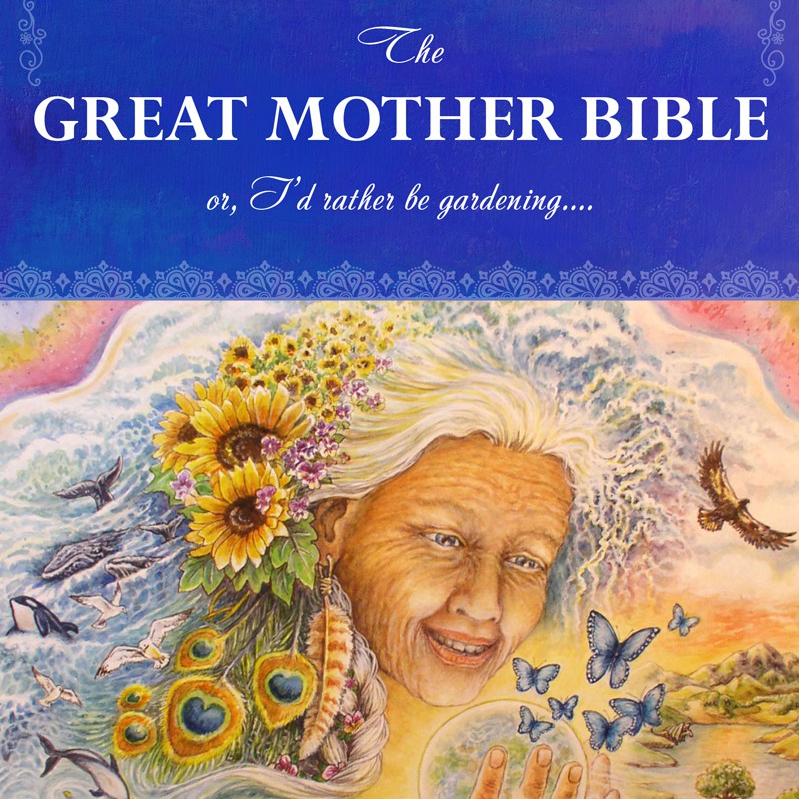 [The first section of this blog is a book written by Gaia Priestess/Mystic Mare Cromwell called Messages from Mother…. Earth Mother, which was released at the end of October, 2012. Several gifted Native American elders have confirmed that Mare is working closely with Earth Mother. You can read all of the Messages from that book here or purchase the printed book independently. It is also available as a Kindle ebook and at other internet venues, and can be ordered from any bookstore in the USA, Australia, Great Britain, and other international sites. It was a beautiful clear Saturday in April. Sarah, an attractive red-haired woman in her early thirties, was out for a long hike at a large mountain park in Virginia that day. She was feeling rather distraught. Her boyfriend had told her the night before that he wanted his freedom to take off and travel the country. Her life felt dismal and she needed to be in the woods. Sarah’s heart was aching from her boyfriend’s surprise announcement. On top of that, she’d been barely able to handle watching the news for the past few months. All the killings, fighting in the Middle East, droughts and floods—it was all so overwhelming. The familiar tentacles of depression were starting to take hold. She hoped that a brisk hike on one of the longer mountain trails in the park would help boost her mood. Being out in nature always helped Sarah feel more balanced and happier. There was something about the ambiance of wild spaces that healed her. On this particular early spring day, the forest was still and there were no other hikers. Just being out in the fresh mountain air and moving her muscles was helping to shift Sarah’s perspectives about her life. Daniel had been feeling restless for months. She did want him to be happy. If he felt called to hit the road and be an adventurer, she wanted to give him her full blessings. Maybe it would be a good thing for her to be single for a while, too. The hiking gave her space to muse, yet her heart still hurt. Sarah loved hiking. She started to daydream about how fantastic it would be if someone hired her to hike. What bliss that would be. She loved being a pre-school teacher but she’d rather be outside in the mountains all day. Oh, the mountains she could climb, the great leg muscles she’d develop. Her mind strayed from noticing the trees and bushes along the trail to pondering the jobs she could find that would issue biweekly checks for hiking all the trails she’d ever want to hike. Maybe she could even get paid for articles about her hikes. She loved to write, too. As Sarah was daydreaming, she came around a bend in the trail and suddenly stopped. To her shock, a roundish older woman who looked like someone from the Middle Ages stood in front of her. The woman was average height and dressed in long, rather dirty dark layers of skirts made of a heavy, coarse material Sarah had never seen before. Her gray hair was pulled back from her beautifully weathered wide face, and a full buxom chest filled out the whitish, splotched peasant shirt she wore. Sarah guessed that this strange person must be in her mid-fifties. She stared at the woman. The woman gazed back at Sarah with the most gentle and compassionate eyes Sarah had ever seen. This woman felt so … so familiar, Sarah thought to herself, though she knew she had never met her before. Yet there was such a warm feeling to her. Instantaneously Sarah felt at ease around her, which was highly unusual since Sarah generally felt very nervous around strangers. “Well, aren’t you even going to say hello?” The woman finally said in a deep husky tone with a strange sounding accent Sarah could not quite make out. “Oh, I exist, all right. I definitely exist. Yep. In more ways than you realize,” the woman interrupted Sarah. “Who are you?” Sarah blurted out. Then it struck her that her blunt question was a very insensitive way to speak to an elder. As she was talking, Mother watched Sarah’s jaw drop lower and lower. “Yes, I know it is hard for you to believe that I’m Earth Mother and that I’m talking with you. This is not an everyday occurrence. I know this. You can come over here and pinch me if you want. I am real,” she added. “Ah, that’s okay…” Sarah said, shaking her head. How can a person just go up and pinch Earth Mother—if this really was Earth Mother? This was all too weird. Part of Sarah wanted to turn around and run. This was stretching her comfort zone beyond anything she had ever experienced before. Yet she was amazed at how safe and at ease she felt around this woman, this so-called Earth Mother in the funny-looking clothing. She could not turn and run. She was transfixed by this woman’s presence. Sarah reached her right hand down to her thigh and pinched it through her pants to ensure she was not dreaming. She definitely felt the pain. This definitely was happening. “Honey, I know this is way out of the ordinary. Believe me, I know this. It is extremely rare for me to appear to a two-legged. But I’ve been waiting for you. I know your boyfriend broke up with you last night. Yes, I know his name is Daniel and you really care about him. And your heart hurts so much right now. I know you’ve been fighting off depression and you’d rather be paid to hike mountain trails more than anything else,” Mother said. Dumbfounded, Sarah wondered how this woman knew all of this about her. Maybe this actually was Earth Mother? Still, nothing from her childhood Presbyterian church had taught her anything about meeting an older woman on a trail who claimed to be The Mother of the whole planet. On the other hand, she had been reading more about Native American spirituality in the past few years. Black Elk Speaks, The Wind is My Mother and some of Hyemeyohsts Storm’s and Jamie Sams’ books were doggy-eared and piled by her bed at her apartment this very day. She had started to embrace the concept of an Earth Mother who was the planet’s consciousness. But one that showed up on the trail as an older woman dressed in funny-looking clothes was stretching it! Sarah looked at the ground and nodded sadly. What this woman was sharing was all true. “Sarah, I know this is a stretch for you to believe that you are talking with me, Earth Mother. But I need your help. I’ve been watching you for a while, and I know you are the two-legged who can do this. I know you’ve been signing the environmental petitions and going to the marches and doing other things, like many of the others who love me. I know you’ve been feeling such love for me. You can help me directly. You can get my message out to the world, share my thoughts about all of these things and more. I need a two-legged to do it, and you’re a good writer and I like you a lot.” Mother gave Sarah a warm smile as she said these things. Sarah listened to Mother’s request and realized that part of her great sadness and depression was because she did feel so powerless with all of the terrible environmental trends. She’d been filling out every petition that came into her email inbox and giving small checks to some environmental and socially progressive groups, but didn’t feel she was making much of a difference. Maybe she could truly help in other ways. Maybe this really was Earth Mother. This woman was not any ordinary woman – that was certain. For one, she was psychic. Plus, her clothes were too different. And, there was that weird accent she had. But what was most convincing was that Mother oozed love. A warm, cozy love that felt so kind and compassionate. The aroma of roses wafted around her, even though there were no rose bushes anywhere around on that trail. Sarah just noticed that, too. All of a sudden Sarah had an overwhelming desire to go up and be hugged by Mother. “Honey, you can hug me if you want,” Mother said. Sarah dropped her daypack and stumbled forward into Mother’s arms. Mother took her in and held her close. Sarah gradually let herself relax into Mother’s chest and felt her heart begin to release what felt like a cloudburst of pain and sorrow. The tears swelled and before she knew it, she was sobbing into Mother’s chest and Mother was caressing her head and her gently. “That’s okay, honey, you just go ahead and cry. Just let it out. I know your heart has been carrying so much. Your beautiful heart …” Mother said. Mother put her right hand on the heart space between Sarah’s breasts and held it there for a few moments. As she did this Sarah felt a gentle warmth come into her chest, move into her torso from where Mother’s hand was resting, and then out to her arms and legs. Mother smiled and removed her hand and stepped back from Sarah. Sarah stood there for several moments feeling a little woozy. The energy Mother had given her seemed to wash her spirit body gently as it moved through her physical body. She felt lighter and more positive than she could ever remember. “Whoa. Thank you. That was intense … I had no idea I had that much sorrow in me. It feels as if you … this is hard to put into words. You … healed my heart,” Sarah said. “Yes, honey, I did. I can heal all sorts of things. My work really is to heal. There is so much healing needed these days. So much …” Mother sighed. “You really are Earth Mother,” Sarah said. “Yes, sweetie, I really am,” Mother gave Sarah a deep smile that was so beautiful, it sent another energy wave through Sarah that made her feel more joyful than she’d ever been in her life. It was as if she were glowing. “Wow. You’re amazing,” Sarah said. “Yeah, I bet that’s true.” Sarah paused for a few moments. How could she say no to this invitation from Earth Mother? This really must be her. It would be beyond words to work with her. She wanted to pinch herself again to be certain she wasn’t dreaming. But it was real. This was definitely happening. Earth Mother hugged Sarah one more time. “But you and I can meet often where we’ll sit down, even have some tea, and I’ll give you some messages I’d really love you to share with the rest of the world. I would really love to be able to do that with you. And you can have more hugs. I might even tell some bad jokes too. You wouldn’t believe some of the ones I hear. I hope you don’t mind bad jokes,” Mother laughed. “Oh, good! I was so hoping that you’d say Yes! Don’t worry about the details right now though. I’ll guide you. Now, I’d like to show you where we’ll meet. It’s a sacred grove near here. Come on, I’ll show you,” Mother said. Mother turned around and tromped off into some thick trees beyond the trail. She was remarkably limber and fast, considering her heavy skirts and round body. Sarah practically had to run to keep up with her. They bushwhacked about a quarter of a mile into the woods, and Sarah was spent and pulling branches out of her hair by the time they got to the edge of a beautiful open glade surrounded by oak trees. As soon as Sarah saw the glade, she completely forgot the branches in her hair and raw scratches on her arms where she’d been thwacked by the underbrush. Its magnificence took her breath away. Along with some thin grasses, there were wildflowers she had never seen before, and she had been a student of the area’s wildflowers since her teens. The glade was a perfect oval about sixty feet across and forty feet wide. The towering oaks around it kept it shaded even in the center where there was a hand-hewn wooden chair and small bench with a low table between them. “Yes, this is quite lovely, isn’t it?” said Mother. Sarah nodded her head as she soaked up the beauty of the grove. Mother then led her into the center and said, “This is where we’ll meet. We’ll have the most delightful time together. I’m so looking forward to this. Oh, and don’t worry, the chairs are quite comfortable to sit in,” Mother winked. Sarah nodded as she continued to absorb the intimate beauty of the glade. It had a quality to it she had never experienced before, a serene vibrancy of joy, it seemed. There were so many different types of birds flitting around in the branches of the oaks, singing so joyfully. There were some bird species new to Sarah there also. It was all so remarkable and magical. “Yes, I think I can do that,” Sarah responded. She knew she’d rearrange anything in her life to have these meetings with Mother, and quietly prayed no funerals or any other emergency would arise. “Don’t worry, it will all work out for you to make our discussions here,” Mother said. “One more thing, I’m going to give you this stone to help you know this did really happen and we shall meet again. I know it may be hard for you to believe we’ve just met after we part this afternoon.” As she was saying this she reached down into the folds of her outer skirt and pulled out a beautiful blue stone that almost matched Sarah’s eyes. “Gosh, that’s really stunning,” Sarah said as she took the stone and looked at it more carefully. “Okay, now put that in your pocket and off you go. I’ve got things I need to tend to elsewhere. Do you see that little gray squirrel at your feet? He’ll guide you back to the trail so you can get on home,” Mother said in a hurried tone. Sarah put the stone in her pants pocket and looked down to see a squirrel she hadn’t noticed before with a distinct white tuft at the end of his tail. The squirrel caught her glance and immediately started bounding off to the edge of the grove where they had entered. “But wait! Mother! How will I know what time? And suppose the weather is bad?” Sarah asked anxiously, watching the squirrel take off. With that, Mother turned and briskly walked to the other side of the glade and vanished. Again, Sarah had to run through the thick trees dodging branches, this time to keep up with Mr. Tufts. He led her back to the trail and then turned around and gave Sarah a quick piercing look that took Sarah aback. She had no idea that squirrels could be that intense. Then Mr. Tufts quickly disappeared into the thick brush in another direction. Sarah sat down on a log about ten feet down the trail toward the direction of her car and pulled her water bottle out of her daypack. After taking a long swig, she pulled out her cell phone and was stunned to see that only five minutes had passed since the last time she looked at it, just before meeting Mother. How could that be? She began to ponder all the things that had just happened to her that seemed beyond any logic or answer. She pulled out the blue stone from her pocket and studied it. It was a deep blue with tiny striations of gray in it. She had never seen anything like it and suspected that no scientist had either. The stone was warm from being in her pocket and had a heavy solidness to it. She held it to her heart and felt a faint ripple of Mother’s energy again. As she put the stone back in her pocket, she made the commitment to carry it with her everywhere she went. It would be like having Mother’s love with her at all times. After some water and nuts, Sarah decided to head back down the trail to go home. She did not feel the need to hike anymore. Her mind was swimming with the day’s events. Was it really just five minutes? Had she just experienced a time warp? Her fingers kept being drawn to play with the blue stone in her pocket as she forced herself to accept that the meeting on the trail did just happen. She had met Earth Mother and was going to be seeing her again, often. Mother said that she’d know when to come back next Saturday just by watching the stone. Sarah wondered what color it would turn and how it would be able to change colors. And how did Mother have the ability to take on a human body like that? The questions bounced around in her head as her sneakers pounded the downhill trail. In spite of the slew of questions in her brain, Sarah felt more at peace and happier than she ever remembered. She also knew she could never tell anyone about what happened that afternoon. They’d think she’d gone bonkers. Whatever she wrote up to publish was all going to be labeled fiction. Of this she was certain. All of the pieces of this blog, plus more, will be compiled in a book titled Messages from Mother…. Earth Mother to be published fall of 2012. Very sweet Mare, and really, not all that fictitious! Looking forward to the messages from Mother Earth! Wonderful story – I’m eagerly looking forward to the messages. Thank you… you know you can read some of the messages here already… I’m hoping that you’ve found them on the website/blog. Oh, Jenese, you inspire me … truly. Yes, yes! Hope you’ve been able to peruse more of the messages too. And the book is now available to order if you want a hard copy. Gosh, your message means so much to me. Thank you! Yes, it does sound as if you are very gifted and I’m thrilled that we are connecting now. You can order the book at: http://www.pamoonpress.com and I’ll autograph one for you and send it right off. I’m so thrilled that we’re talking on this level. Tell me, where do you live? I’m in the process of setting up book events and am exploring traveling to different regions of the country. I will definitely have books next month. So no worries there. And I understand the knowing of the path but uncertainty as to where it is going. I just trust that it will guide me closer and closer serving Earth Mother and Spirit. That’s what I want…to know I am serving Earth Mother and Spirit and to know and feel that what happens to me with my “gifts” is real and really happens and to know what I am suppose to do with them. I want so much to grow with Spirit and with nature and with communicating with animals and all of nature around me. If that is your intent, then you shall manifest this. Keep on listening and keep on praying and your heart and Spirit will guide you.